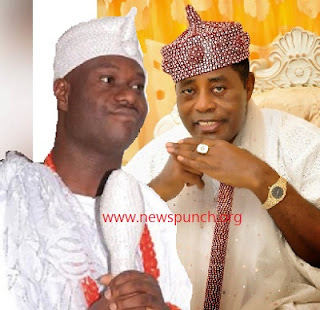 The supremacy fight among Yoruba obas may have escalated as the battle have also ensued between between the Ooni of Ife, Oba Adeyeye Ogunwusi, and the billionaire Olugbo of Ugbo, Oba Obateru Akinruntan, over which throne is the monarchical seat of power in Yorubaland and the origin of Oduduwa, the so-called progenitor of Yoruba people, fresh report according to Sunday Punch Newspaper details. The Ugbo monarch disagreed with the Ooni, who described Moremi as a goddess and recently built a 42-foot statue in her honour. To the Ondo monarch, Moremi was a traitor who betrayed her husband, Osangangan Obamakin. But in a swift reaction, the Ife monarch said Olugbo did not have deep knowledge of Yoruba history. The Olugbo, in a statement issued by the Olugbo-in-Council, said, “We, the Olugbo–in–Council, found such (Ooni’s remarks about Moremi) unguarded statements and historical fallacy disturbing, particularly when such emanated from a monarch who is expected to be a custodian of history, customs and traditions of Yorubaland. We hereby state categorically that we are Ugbos, the aboriginal settlers and owners of Ile-Ife. But Oba Ogunwusi, who spoke through the Director of Public Affairs of the Ooni’s Palace, Moses Olafare, said the Ooni would not dignify the Olugbo with an answer because he was more focused on achieving unity among all Yoruba people and would not allow himself to be distracted. He said, “This outburst of Olugbo can only be viewed by well-meaning people as a pitiable act of absurdity that doesn’t deserve serious attention by serious people. How on earth could a Yoruba king refer to Moremi as a traitor because she used her power as a woman to liberate her people from incessant invasions by some faceless terrorists? “Most paramount on the mind of His Imperial Majesty, Ooni Adeyeye Ogunwusi Ojaja II, with the unflinching support of the Alaafin, baba; the Awujale; the Alake; the Orangun; the Deji; the Ewi; the Osemawe; the Olubadan; the Oba of Lagos; and other relevant peace-loving monarchs in Yorubaland and in other parts of the country is and remains the much-needed progress of Yoruba nation which can only be achieved through peace and unity.